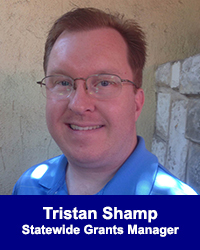 Tristan Shamp - California Consulting, INC.
Tristan has been with California Consulting since 2009 serving both as a project manager and as the firm’s Statewide Grants Manager. In this position, he oversees the statewide operations of the company’s grant writing program including grant writer support, grant writing quality control, and grant research among other items, in addition to some client retention activities and business development. Tristan comes from an extensive background in academics and project management. He earned a Bachelor of Arts degree in History from the University of California, Los Angeles in 2005, and a Master of Arts degree in History at California State University Fresno in 2009. Tristan has taught credited courses at CSU Fresno, been a supplemental instructor at Fresno City College, and coordinated various academic programs with local education agencies while working for a Fresno-based private tutoring firm. Tristan has written over 270 competitive grant applications since 2009. He completed the Grant Writing & Management Program through CSU Fresno in October 2010 and holds a professional certification in grant writing and program management.